On Phoenix’s iconic peak, a spring day on the slopes means gorgeous views, classy cocktails, and roses galore. 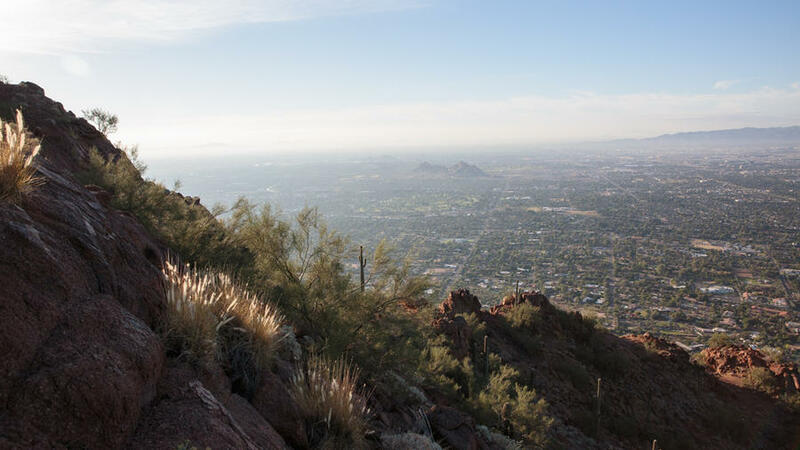 We tapped Scottsdale-based writer Nora Burba Trulsson as our mountain guide. Here, her five picks for a peak experience. Instantly recognizable for its dromedary shape, Camelback Mountain (4925 E. McDonald Dr.) juts out of the desert, straddling Phoenix, Paradise Valley, and Scottsdale, lavish homes and resorts clinging to its lower flanks. When development threatened the peak in the 1950s and ’60s, a grassroots effort—spearheaded by Senator Barry Goldwater—spurred locals to save the area as a preserve. It’s been a favorite urban hike since, but now there’s a new reason to head for the hill: Last year, the popular Echo Canyon Trailhead reopened after a $4.5 million makeover, in which workers stabilized the trail, added more parking spaces, and built a shade shelter. The 1.3-mile trail begins gently, but after the first quarter-mile, it’s a strenuous, lung-busting scramble over lichen-dotted boulders. The reward? A stunning 360° view of the valley. Near Camelback’s southern slope, eucalyptus trees shade Berridge Nurseries (4647 E. Camelback Rd. ), the local gardeners’ go-to spot for nearly 80 years. The nursery specializes in desert-friendly roses, with more than 100 varieties. Resident cats Blackie and Spuds prowl gravel paths past shrubs, succulents, and quirky yard art. The on-site potting expert can help you design a showstopping container, or for more ideas, visit on April 11 for the free Art in the Garden festival, a day of art exhibits, gardening demonstrations, and food trucks. For more inspiration, head up the road to the Shemer Art Center (5005 E. Camelback Rd. $7 donation suggested). Built in 1919 as a winter home, the mission-style house and its grounds have blossomed into an art hub. Wander the galleries inside or across the lawn, where 20-foot-high metal sculptures use the mountain as a backdrop. Like the art? Everything’s for sale, plus there’s a gift shop with everything from silk scarves to jewelry made from found objects. This month, Shemer’s galleries will showcase sculpture, photography, and paintings by emerging artists. A plein air sculpture at the Shemer Art Center. When the sun slides low behind Praying Monk, one of Camelback’s most notable rock formations, mountainside happy hours kick into high gear. On the north slope, Jade Bar (5700 E. McDonald Dr., Paradise Valley) draws valley glitterati with big views of Mummy Mountain and Paradise Valley. Sip a sweet litchi martini, munch on charred edamame, and drink it all in. Downhill, El Chorro (5550 E. Lincoln Dr., Paradise Valley)—a onetime girls’ school turned classy watering hole—entices with lush patios, an indoor-outdoor bar, and sticky buns. On the mountain’s south side, The Henry (4455 E. Camelback Rd.) combines serious mountain views with elevated appetizers (such as smoked salmon on hash browns) and adventurous cocktails. Chef Paul McCabe knew he had to tread lightly in revamping the menu and the look of T. Cook’s restaurant (5200 E. Camelback Rd.) at Royal Palms Resort, A Destination Hotel, beloved for serving a Mediterranean menu in a romantic setting at the base of Camelback. The resort, which originated in 1929 as a winter retreat, has become a local landmark, its cobblestone courtyards and bougainvillea-draped grounds enchanting visitors for more than 60 years. The eatery now combines a brightened dining room and expanded bar with a new menu, which melds Old World influences with top-quality local ingredients. McCabe pairs Colorado lamb with Arizona wheat berries and enlivens the roasted beet salad with oranges gathered from resort trees. For an indulgent return, reserve a spot for the weekly #PM31 (chef’s initials and the table number where it happens) dinner, when McCabe prepares and serves an ever-changing meal of at least 12 courses for a small group ($150/person plus $70/person wine pairing). T. Cook’s boasts a new menu.